Gold Plater SRS-069 | Welcome to A.P.E. 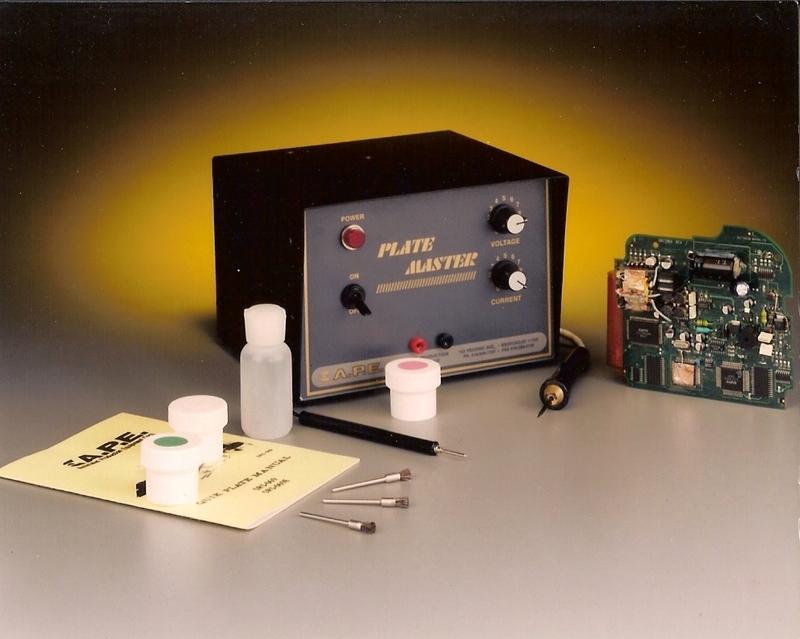 The Quik Plate System allows you to clean and electro-plate printed circuit boards and electronic assemblies. Standard supplies include gold solution, nickel solution and electro clean. Available optionally are tin, lead, copper and silver plating solutions. See plating supplies replacement parts in A.P.E.’s Parts Book and Engineering Data. OverviewThe Quik Plate System allows you to clean and electro-plate printed circuit boards and electronic assemblies. Standard supplies include gold solution, nickel solution and electro clean. Available optionally are tin, lead, copper and silver plating solutions. See plating supplies replacement parts in A.P.E.’s Parts Book and Engineering Data. The SRS-069 which has both a voltage and current control, is microprocessor controlled which automatically adjusts voltage and current control for depletion in solution for military specification plating.The Quick Plate SRS-069 is a low power system. The control circuit is a precision voltage source where the output voltage controls the activation of the plating solution. This voltage is controlled to greater than three percent by the internal regulator. The current control on the SRS-069 determines the rate and the amount of plating that is deposited. The current is a precision current source that insures uniform plating and when set, will not allow burning or arcing. The precision current source uses a high gain operational amplifier integrated circuit. The current control setting changes the gain of the difference amplifier and when the setting and current are the same the amplifier controls the regulator from supplying any more current. Quick Plate Kit (Part No. 0690-0002) uses PRS-475 and PRS-475G systems with DC pulse plating power source. PC board edge connectors and other device contacts for excellent conductivity without corrosion. Between base copper and overplate of gold to prevent copper migration. Overplating on mild steel. Fast buildup over 0.0003 to 0.0005 in. thick Copper High Speed copper alkaline. Thin buildup over aluminum or mild steel. Directly over base copper materials. Tin-Plating Alone for solderable surfaces or underplating for tin-lead.